Plywood is a well known building material. It was once used extensively in new home construction as sheathing on the exterior of house walls, the roof deck and sub-flooring. Today oriented strand board (OSB) has replaced plywood in most of these places to lower construction costs. And now cross laminated timber or super plywood is bringing new changes. The construction industry is developing new building materials continuously. The goals are to lower building costs while building homes that are more energy efficient with less impact on the environment. What's exciting is how the Internet is enabling us to learn about innovations in home construction faster. This promotes more competition and better building products from around the world, are gaining entry into the US sooner than they once did. Cross laminated timber (CLT) is called super plywood because it follows the same manufacturing process as plywood. They're both made from layers of wood that are glued together, with the wood grain rotated at right angles to the adjacent layer. This process helps to reduce shrinkage and improve the strength of the finished sheet material. Plywood comes in 4 by 8 foot sheets that are 1/4, 3/8, 1/2, 3/4 and one inch thicknesses. It's available with different finishes for the many different ways it is used, from sheathing that's never seen to higher grade wood on overlays for finished projects (see What Plywood Finishes Are Available In Today’s Market? for more details). CLT is much thicker than plywood because it includes the framing. Plywood is applied to some type of framing while CLT integrates the framing, insulation and sheathing or sub-floor for walls, floors and the roof. Australia's first cross laminated timber (CLT) house and more! You've heard of Energy Star and hopefully it's companion Water Sense. These are some of the related green building initiatives begun in the early 2000s, focusing on building more efficiently. In fact, many of the new building materials used in new home construction today got their start in industrial and/or commercial construction. Cross laminated timber is part of this evolution to build better structures while lowering our impact on the environment. So CLT achieves these goals by using sustainable lumber and combined with the manufacturing process, uses 50 percent less energy than concrete and steel. Quicker construction because walls and floors can be built at the factory and assembled on site much faster than traditional “stick built” assembly of a home or office building. Cheaper because the CLT manufacturing process is able to build custom wall, floor and roof panels using automation, thus reducing the labor involved in traditional stick built construction. Cleaner and quieter job site because the panels come ready to assemble, reducing/eliminating the amount of cutting to be done on site. But what does that really mean to you as a homeowner? It's been said that a picture is worth a thousand words so … Check out the video above showing the story behind Australia's first cross laminated timber house. 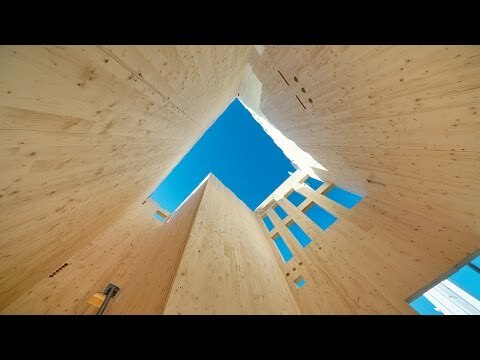 It does a great job of comparing traditional stick built construction to a home built with CLT, or “jumbo ply” which is the nickname used in the video. For more articles on green, sustainable building techniques … visit Green, Healthy and Safe.